Cast Iron Cookware- Or, How to Get Rid of that Toxic Non-stick Stuff you’ve Had Forever. A heavy, but essential, addition to the kitchen, cast-iron cookware is dependable and full of history. The other day someone asked me how I cooked eggs or hash browns without a non-stick skillet. I told them I used my 100 year old cast-iron skillets, wonderfully non-stick because I keep them seasoned correctly, never, ever use soap in them…eggs and hash brown slide right out. I have a 6 inch skillet, 2 12 inch skillets, a 12 inch round griddle with a handle, a 30 year old 12 inch Dutch oven with a lid and an antique cast iron waffle maker with a iron ring to use on the stove top. They all perform beautifully. There is no reason to pay more for a pre-seasoned pan, or pans such as La Crueset with enamel that cost a small fortune. These pan are non-stick when seasoned, and kept that way. 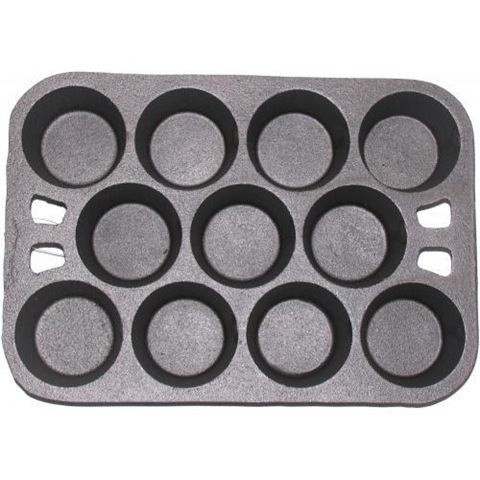 Besides being an ideal heat conductor, cast iron heats evenly and consistently, it is inexpensive and will last a lifetime (actually several lifetimes) with proper care, and it is an old-fashioned way to cook non-stick. When well seasoned, a cast-iron pan will be stick resistant and require no additional oil. The benefits of cast-iron pans are terrific: Foods glide out of it as from no pan made with Teflon; it goes from stove to oven; no special utensils are needed to cook in it and cleanup is a cinch. It’s time people realize the culinary wonder that a cast-iron pan can be! As a chef, I consider cast-iron pans to be precision cooking tools, as these dependable pans enable precise control of cooking temperatures. Their heat retention qualities allow for even cooking temperature without hot spots. 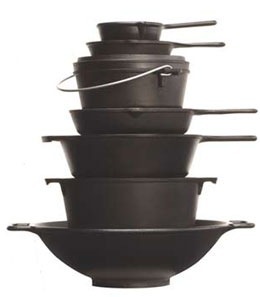 Cast-iron pans can be used on top of the stove or to bake in the oven. All our grandmothers had cast iron skillets and stove-top griddles. In fact, your grandmother swore by it and the pioneers depended on it. If you don’t own a cast-iron skillet, it’s well worth the time and money to invest in one. You can find them for sale on the internet, at cook stores everywhere, thrift stores, flea markets, or you can scour the tag and yard sales for one that might look as if it has seen better days. If the pan is rusty or encrusted with grease, buy it anyway. Don’t worry! I’ll tell you how to get that new or old one into shape so you can enjoy it for a lifetime of non-stick cooking. You’ll be able to pass the pan on to your own children and grandchildren. All new (not old pots) cast-iron pots and skillets have a protective coating on them, which must be removed. American companies use a special food-safe wax; imports are covered with a water-soluble shellac. In either case, scrub the item with a stainless steel scouring pads (steel wool), using soap and the hottest tap water you can stand. If the pan was not seasoned properly or a portion of the seasoning wore off and food sticks to the surface or there is rust, then it should be properly cleaned and re-seasoned. Seasoning a cast iron pan is a natural way of creating non-stick cookware. And, like you cook and clean the modern non-stick cookware with special care to avoid scratching the surface, your cast iron cookware wants some special attention too. You season a cast iron pan by rubbing it with a relatively thin coat of neutral oil (I stress a light coat of oil). NOTE: NEVER use vegetable oils (canola, sunflower, etc. ), or shortening (like Crisco shortening) to season your pan. These oils get very sticky when heated (the same as they do in your arteries!!) Use coconut oil or lard for seasoning your cast iron pans. You can also use butter. Place the cast iron pan, upside down, in the oven, with a sheet of aluminum foil on the bottom to catch any drips. Heat the pan for 2 hours in a 250 degree oven. Once done, let the pan cool to room temperature. Repeating this process several times is recommended as it will help create a stronger "seasoning" bond. The oil fills the cavities and becomes entrenched in them, as well as rounding off the peaks. By seasoning a new pan, the cooking surface develops a nonstick quality because the formerly jagged and pitted surface becomes smooth. Also, because the pores are permeated with oil, water cannot seep in and create rust that would give food an off-flavor. Your ironware will be slightly discolored at this stage, but a couple of frying jobs will help complete the cure, and turn the iron into the rich, black color that is the sign of a well-seasoned, well-used skillet or pot. Be careful when cooking with your cast-iron pots on an electric range, because the burners create hot spots that can warp cast iron or even cause it to crack. Be sure to preheat the iron very slowly when using an electric range and keep the settings to medium or even medium-low. Unless you use your cast-iron pans daily, they should be washed briefly with warm (not hot) water and a green scrubbie, then rinsed and thoroughly dried in order to rid them of excess surface oil. If you do not do this, the surplus oil will become rancid within a couple of days. After you clean the skillet (and this is easiest if you clean it while warm), rub a small amount of coconut oil over the surface. Remember – Every time you cook in your cast-iron pan, you are actually seasoning it again by filling in the microscopic pores and valleys that are part of the cast-iron surface. The more you cook, the smoother the surface becomes! Cast iron is 50 percent pig iron and 50 percent steel. It’s cooking properties have been championed and cherished for generations. I use only cast iron or triple bottom stainless steel to cook. 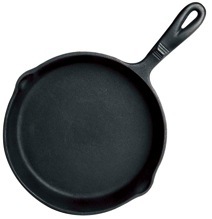 Cast iron for frying or scrambling eggs, frying bacon or steaks, sautéing onions or other veggies. Never cook acidic food such as tomatoes in cast iron, you will remove the seasoning. 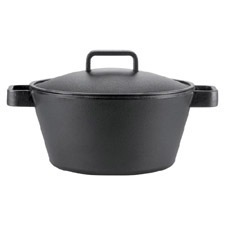 I use my cast iron Dutch oven for sautéing roasts or other cuts of meat that I need to brown first, then finish in the oven. My favorite is a Provencal Chicken that I make a little bit of dough to seal the lid to the pot. It seals it completely and when the seal is broken the steam coming out with the smell of chicken, herbs and garlic is amazing! The technology for making cast-iron cookware has come a long way in the last 100 years, but each piece is still cast in sand moulds. Yes, sand. This method goes back to the Chinese. At Lodge, the biggest cast iron company in the United States, the iron/steel mixture is melted with electro-magnetic heat to 2,500°F. The pouring of the molten metal into the sand moulds has been automated. It’s this automation that has made Lodge the industry leader–and survivor. They were also the first, and only, cast-iron company to offer a pre-seasoned pan. This means the pan is ready to go when you buy it.